So you want to be a Nurse Practitioner? 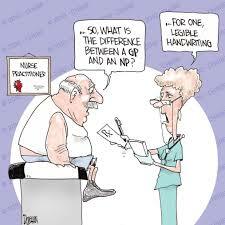 First let me say that Nurse Practitioners (NPs) play a valuable role in our health care system. As nurses with clinical expertise from years of experience working with patients and advanced educational training, NPs have a lot to offer patients, healthcare teams, and organizations. NPs are awesome and job opportunities for nurses in this role are increasing, in part because they are a more cost-effective healthcare resource than general physicians. However, in talking to nursing students, reviewing scholarship applications, and entering survey data from new graduate nurses, I have noticed that everyone and their dog seems to want to be an NP. I have also fielded lots of questions from people about how to get into the NP program, mainly “what GPA do I need?” and “what’s the minimum amount of experience I need before I apply?” Another thing that I have noticed is that many people who did not choose nursing as their first career choice wanted to be doctors which makes me wonder if some people see nursing only as a means to become an NP, under the misconception that NPs and doctors are pretty much the same thing. Let’s unpack this a little bit. 1. We need more NPs but we need way more nurses. I hate to bust your bubble but from a resource planning perspective we need way more RNs in the workforce than NPs. It’s actually more competitive to get into nursing and Canadian NP programs than medical schools. To boot, in Ontario you are only allowed to apply to one program per year so if you don’t get in (which is highly probable), better luck next year. 2. If you don’t want to be a nurse, do something else. This may seem ironic coming from someone who’s career goal is to becoming a nursing professor but I wholeheartedly love being a geriatric rehab nurse and if I didn’t care so much about the bigger picture I would be happy to work full-time as a staff nurse. I believe that most nurses who become NPs really want to make a difference in that role and I admire that. However, I think that one of the things that makes the NP role so valuable is the wealth of nursing experience that people bring with them. You can’t skip that part and if you don’t like getting your hands dirty working in the trenches, perhaps you should reconsider your career choice. After all, chances are pretty good that you will work as an RN rather than an NP for most of your career. There are also tons of other people who would love to be a nurse and you are taking their spot. I’d also like to point out that if you wanted to be a doctor and end up working as a staff nurse you might end up really hating your job and being resentful. Maybe not the best life choice. 3. 2 years of experience is not enough for most people and who cares about your GPA, really. Some of my research work is on new graduate nurses and we consider a new graduate nurse anyone with less than 2 years of nursing experience (and sometimes even 3 years or less). Patricia Benner also outlines the stages of development from beginner to expert nurse, stating that it takes about 3 years to become competent and at least 5 to become an expert. Given that we know that it takes several years to develop nursing expertise, it baffles me that nursing schools allow nurses with a minimum of 2 years of clinical practice to apply to their NP preparatory master’s programs. Moreover, it concerns me that some people are in such a rush to become NPs without considering the amount of responsibility that comes with their new role and the benefits of having more experience (to their patients as well as themselves). There are exceptions I’m sure but I really think we need to reconsider the minimum experience requirements, especially considering that there is high demand for NP education. While I’m on the topic of NP education, I don’t think GPA is necessarily a good indicator of an excellent nurse or of someone who will make a fantastic NP. That isn’t to say that you can’t have a high GPA and also be an awesome clinician. My point is that there are amazing nurses who are highly knowledgeable and skilled, with high levels of emotional intelligence and leadership skills that may not have achieved a 4.0 in their undergraduate nursing program. I don’t think we need to throw the baby out with the bathwater here because the NP program is demanding and rigorous but it would be nice to see other elements included in the application process. In real life it doesn’t matter what your GPA was if you have limited social skills or can’t apply the knowledge that you learned in a meaningful way. Before you jump on the “I want to be a Nurse Practitioner” bandwagon, I hope that you will take some time to engage in self-reflection about where you are in your career and what skills, knowledge, and experience you have to offer, as well as areas that you want to develop further. Just because you have a perfect GPA and can apply to an NP masters program after 2 years of working doesn’t mean you should. Not everyone is cut out to be an NP and being an RN can be as rich and rewarding a career as you want it to be. Thank you for this very thorough assessment of the advanced nursing position. You are right many nurses aim to have their master’s degree at very early level in their career, but I have to say that years of experience is not the only thing that qualifies an RN to continue his/her education. NP title is all about leadership, good management, and critical thinking, and i believe either some people have it or not. Highly competent nurses with good leadership skills, critical thinking, and ambitions should apply for a master’s degree as early as 2 years post her career. Please not that I know NPs who stay at the bed side, they don’t all aim for a private practice. I have to say that saying no to RNs applying for a masters program only because they have a relatively short period of experience is somehow not very convincing. Thank you again and read my post of “why do we need advanced practice” I think it might interest you. Thank you Rachel for taking the time to respond to my post. I think it’s important to look at things from multiple perspectives 🙂 I enjoyed your post about the need for advanced practice nurses. Thanks for sharing! I also think that experience is valuable (and difficult to quantify!). To some extent, years of experience is arbitrary since every nurse will have a different experience. However, based on the current evidence about new graduate nurses I think that for many it takes at least 2 years to feel confident in their professional role. Of course there are exceptions (like most things) but I think more experience helps bring perspective and practical knowledge that benefits NPs as they go through their advanced training and in practice. As an aside, in Canada we have a public healthcare system so most NPs work in primary care clinics or in hospitals rather than for themselves. Hope you have a great day and I will definitely be keeping my eye on your blog!